Jerome A. Ashby was known as a member of the New York Philharmonic but revered even more as a teacher, mentor, and human being. Many colleagues and students hold him in the greatest affection. He died on December 26, 2007 after a long struggle with prostate cancer. He said that his last year, when he drew closer than ever to family and friends, was the best of his life. Jerome (known equally as Jerome or Jerry) was a native of Charleston SC. He began his studies in the New York City public schools and graduated from the High School of the Performing Arts. He then attended The Juilliard School, where he was a student of former Philharmonic principal horn James Chambers. 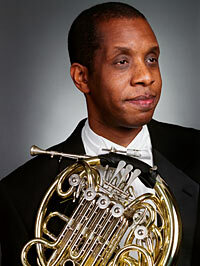 After graduating from Juilliard in 1976, Jerome became principal horn in the UNAM Orchestra in Mexico City. There he met and married his wife, Patricia Cantu. He began his tenure with the New York Philharmonic as Associate Principal Horn in 1979 at the invitation of Zubin Mehta and made his Philharmonic solo debut in April 1982. In 1989 Jerome played the fourth horn solo in Beethoven's Ninth Symphony when Leonard Bernstein conducted members of the New York and Berlin Philharmonics in a historic broadcast to celebrate the fall of the Berlin Wall. W. Marshall Sealy, a free-lancer in New York, recalled sharing day care with Jerome when they were about 10 years old. Later they formed an all-black horn quartet with Greg Williams and Bill Warnick. "Jerome was my inspiration, my support toward being the best horn player I could be, my role model, my motivation, and my closest friend," says Marshall. Julie Landsman, principal horn at the Metropolitan Opera and a colleague of Jerome's at Juilliard, remarked, "At the funeral service, I was struck by the fact that almost everyone there referred to Jerome as 'my best friend.' The number of 'best friends' Jerome had is a sure testament to his generous heart." Marshall also commented, "Maybe he was not aware of it, but because of his high standards for excellence and his first-class achievements, he opened many professional doors for other African-American horn players." Julie recalled, "Our endless discussions about our students were invaluable to both of us. We shared a deep mutual concern for our students - a love, really, as they became our children - and I treasure the memories of these times with him." Alan Spanjer, second horn in the Philharmonic, recounted, "Jerry was completely committed to teaching and his students. Once we were talking about how busy he was with teaching so much, and he said to me, 'That's what it's all about, isn't it.'" Erik Ralske, third horn in the Philharmonic, said, "Jerome taught me a lot about the horn and about life - sometimes by example, sometimes with concise, but gentle words, and often with his humor. His ardent love of music and the horn remained a constant inspiration, and he was unfazed by the trials of professional life." Howard Wall, fourth horn in the Philharmonic, commented, "One of the things I loved most about his playing was his beautiful slurs. He was one of the hardest-working horn players I knew." An active recitalist and chamber musician, Jerome appeared at music festivals around the world. He performed with The Chamber Music Society of Lincoln Center and with New York Philharmonic ensembles. He also played in the Gateway Festival at Eastman, a gathering of black musicians, including the Bach Brandenburg No. 1 and Beethoven's Ninth Symphony. Jerome was a faculty member of The Juilliard School, Manhattan School of Music, The Curtis Institute, and the Aspen Music Festival School. He was elected an IHS Honorary Member in 2007. Extended tributes to Jerome appear in the May 2008 issue of The Horn Call.